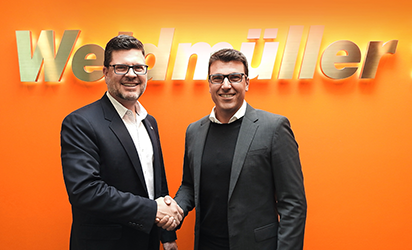 Terry Hodgson (left), executive vice president of Weidmuller Inc, North America, congratulates Javi Richmond as the newly appointed managing director of Weidmuller Canada. The Weidmüller Group of Richmond, VA, has announced that Javi Richmond recently joined the company as managing director of Weidmuller Canada. Richmond replaces Terry Hodgson, who has been promoted to executive vice president of Weidmuller Inc, North America. As managing director of Weidmuller Canada based in Markham, ON, Richmond reports directly to Hodgson and has primary responsibility for leading the Canada organization in the areas of sales, marketing, finance, human resources and operations. Richmond brings extensive and demonstrated experience in the electrical and electronics manufacturing industry. Prior to joining Weidmuller, he was employed by E.B. Horsman & Son, most recently in the position of vice president of sales. During his tenure with E.B. Horsman & Son, Richmond also served as regional manager, with responsibility for strategic growth and supply planning. Richmond began his career in the electrical and electronics manufacturing industry with Weidmuller Canada. He first served as marketing coordinator and moved up to sales and management positions in British Columbia and was later promoted to Eastern regional sales manager in Ontario. “I’m excited to return to Weidmuller at this time, and to be a part of the company’s continued growth and expansion in the Americas,” said Richmond. He earned a bachelor’s degree from York University in Toronto, Ontario, and a Master of Business Administration from Royal Roads University in Vancouver, BC. He served as Board Chairman of the BC Electrical Association from 2017 – 2018.